Last year I bought a pack of Evening Primrose seeds, Oenothera Odorata “Apricot Delight” and this year, they have flowered. Evening Primrose is a strange kind of plant in some ways, it grows long wavy flexible stems that have flower buds all along their length. They don’t open all at once but – like a Hemerocallis (day-lily) – there’s one flower per day. The bloom opens in the evening, releasing a strong and sweetly fragrant perfume and turns orange and withers by the same time the next day. It’s really difficult to take pictures of Evening Primrose, the flowers are at their best when they’ve just opened in the evening, but the yellow is so beacon-bright that it dazzles the camera. It’s just as well that there’s only one flower a day because if they opened all at once, you’d be able to see the garden at night from the International Space Station. I’m really glad I have this plant, it was straightforward to germinate from seed and happily survived the winter. Flowering at a sedate pace means they’ve been going for well over a month now and they show no sign of stopping, there are plenty more flower buds waiting for their day to open. 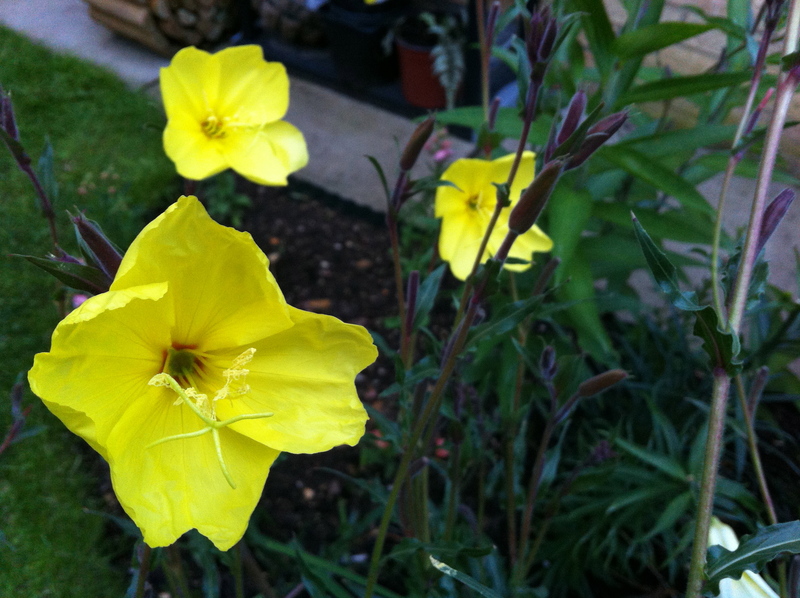 It’s a shame the Evening Primrose doesn’t do so well where you are. I don’t know much about the plant at all – I don’t even know if it’s biennial so I can’t advise you – sorry! Also, thanks for your kind comments about my site and I hope you have fun looking around and reading the posts. Sunil, I don’t have Evening Primrose planted in my garden, but it grows wild around here; and the flowers are usually still open when I go out for my morning walk. The one that I usually see is a local native, Oenothera biennis, which typically grows 5 or 6 feet tall (almost 2 meters). I haven’t seen them blooming yet this year, but I’m sure they’ll put in an appearance soon. Sunil, that sulfur-yellow just about glows in the dark! I haven’t tried the odorata but grow O. macrocarpa which is more or less drought tolerant enough for New Mexico. It has that same color flower and drives my camera just as crazy. Straightforward germinators are fine things. Just discovered your blog via Jean and am enjoying it! Thanks, Stacy. I’ve tried to take a picture of the primrose so many times but the yellow completely blows out. Hope you enjoy looking around this site and reading through the posts. Thanks for visiting. I’m glad you enjoyed my recent postings. I’m looking forward to sowing more seeds this autumn as it’s such a lovely plant that I want to dot it about the borders in the front and back.